Monthly XI0 Bag is a jewelry subscription featuring 3-4 newly released, trendy pieces every month. Each bag is curated by XIO’s founder Ylette, or other fashion or beauty industry gurus. Check out all of our reviews of Jewelry Subscription Boxes for other options! Each month XIO presents us with an innovative, on-trend theme that coordinates with each accessory. This month our hearts will soar with cute pave style hearts and classy pink baguette crystals! Good to Know: As long as your membership is valid, you can enjoy 20% off the entire site (applied as a refund to any purchase). On the back of the info card, XIO lists each item featured as well as what each piece is made of and its retail value. All jewelry this month is comprised of gold plated 925 sterling silver. Sweet Nothings Pave Studs are bigger than the usual studs I go for, but the brilliance of the gems against the gold metal gets me every time. These studs fit comfortably on my ear, and I think they are the perfect balance of cutesy and classy; they are definitely giving me Kate Spade vibes! Here is a photo to help gauge the size of these darling studs. I love them! I paired them with the Keep Shining Pave Hoops featured in January’s box (see review here). I’ve been such a huge fan of Xio’s bigger pendants, this one especially! This pave piece matches perfectly with the earrings above for the perfect Valentine’s day jewelry outfit. The chain on this necklace measures 19 inches in total with a 1.5-inch extender. I really like how this pendant is in a fixed setting; I hate having to slide necklace closures back all day long! Pave style jewelry has a way of really capturing the light in the most beautiful way! This piece would look great dressed up, or it could be a fun way to spice up your everyday work attire. This sophisticated necklace has a train of 11 pink baguette crystals; it is a nice piece, but it definitely isn’t my style. I know a pretty lady, though, who is due for a fun surprise from her almost daughter in law. The length of this necklace (including the crystals) just isn’t me, even when I pull it back a little bit. The Verdict: Monthly XI0 Bag has become my favorite jewelry subscription. 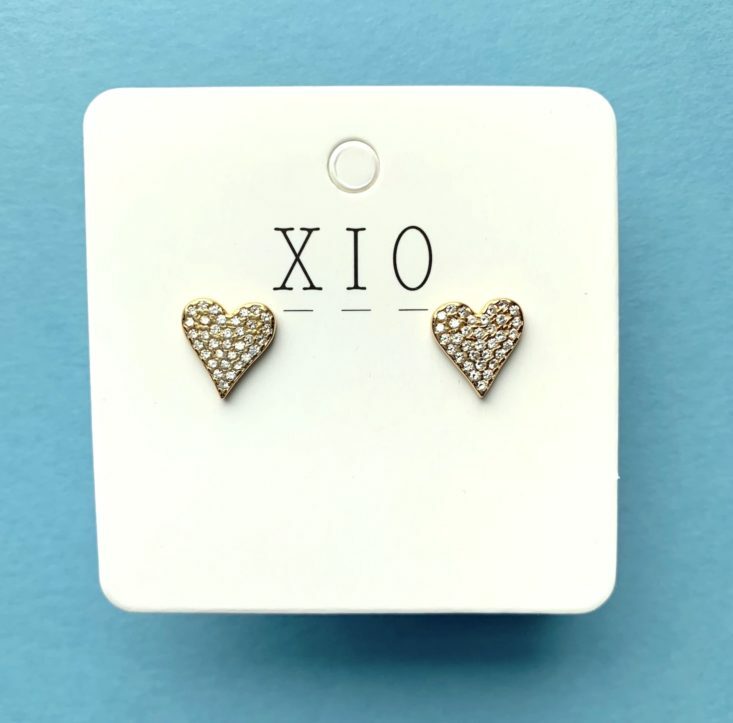 I love the pair of heart studs and the corresponding necklace, which will make me feel extra festive this Valentine’s Day. The Love Stoned necklace just wasn’t for me, but that is the beauty of subscription boxes! These pieces make the perfect gift, this month especially if you are going to exchange gifts for Galentine’s Day! Can you still get this box if you sign up today? This month’s bag is available while supplies last. 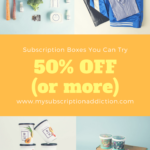 Coupon – Use code MSA5 to save $5 off your first month! Alternatively, for $69.98, each piece of jewelry has an average cost of $23.33. What do you think of this jewelry subscription? How do subscribers rate Monthly XIo Bag? Do you subscribe to Monthly XIo Bag? Add your rating now! This sub just seems expensive. I’d love to sub to this box, but I cannot afford it right now. I wish there was a less expensive jewelry subscription box out there. If this box was a little less expensive and shipping was free, I might actually could sub to it. Thanks Jb! I had never heard of it, but it looks fun! I absolutely love both of the heart pieces. That last necklace is not my style either and unfortunately I don’t even have anyone I could gift it to. Otherwise I might have been very tempted. I’m curious though, given the above average price for this sub (and for the shipping considering the small size and weight), what metal is their jewelry made of? Oops! My mistake. I just double checked and found the metal info. Thanks for the great review!